BEST-MK 1312 is a one-component, solvent-free, high strength and capillary anaerobic curing adhesive based on di-methacrylate-ester. BEST-MK 1312 is especially recommended for bonding of coaxial parts like bushings and bearings and for sealing of cast iron parts. It is also recommended for subsequent bonding and securing of thread connections and repairs of hairline cracks in metal casings. 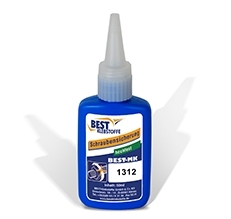 BEST-MK 1312 combines high strength with excellent chemical resistance. The break loose moment is very high. Disassembly of thread connections might cause damage to thread or screw. The low viscosity provides a good capillary action supporting an even distribution of the product on the bonding surfaces. The adhesive is especially recommended for subsequent application. Due to its low viscosity the adhesive fills in gaps and very fine hairline cracks and cures in place.